Using blockchain, the advertising industry can potentially become more sophisticated. What can we expect from the “adchain” idea? Ad Tech is one of those industries that is always in an active search for the next big technological breakthrough. The reasoning behind that is simple: new technologies open up newer and better opportunities for doing more sufficient advertising business. Considering how problematic are issues of privacy and transparency in advertising, blockchain seems to be a reasonable technological solution with the most potential to make a positive impact. At the moment, there is no technology more enigmatic and perspective than blockchain. Everyone has their own opinion on it and its business prospects. There are numerous predictions, an innumerable number of various pitches, and mind-boggling level of enthusiasm surrounding this technology. 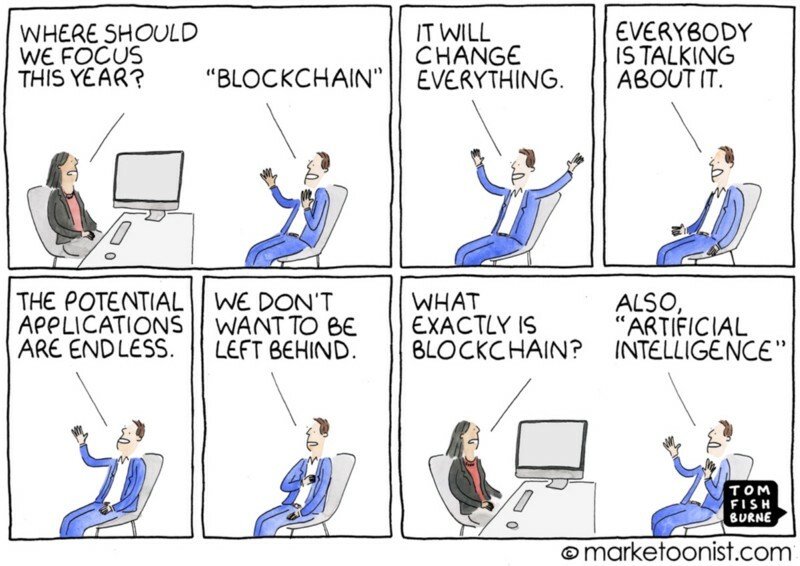 According to the hype, blockchain is nothing short of being the lord and savior of every industry imaginable (and a couple of theoretical too). If you go through the think-pieces and overviews, blockchain can seemingly be applied to everything. And yet there is nothing specific about it. More on the reasons why later. Sure, blockchain reimagines the way banking is performed over the Internet via cryptocurrencies. It also reshapes the entire medical and insurance management and it decreases the influence of the third parties in the majority of operations. But it is too soon to say anything definite about its long-term prospects. For now, blockchain is in the fad stage and only after it will pass we will see the real worth of blockchain as a technological solution. Before that will happen, understanding blockchain is what we need, along with the knowledge of what it can bring to the table. The blockchain is a network of distributed data blocks linked and secured with a little help of fine art of cryptography. It was introduced in 2008 by none other than Satoshi Nakamoto (aka nondescript bitcoin dude). Originally designed as a cryptocurrency transaction framework, it slowly moved beyond to the other areas and is now used in such fields as medical care and insurance systems. In a way, a blockchain is a new form of a database. Just like a regular database, blockchain allows storing, validate, authorize and transmit data over the internet. The difference from a regular database is that it is not situated on a server located somewhere - blockchain is a distributed network of data without centralized authority. It is installed on specific computers by involved parties in order to enact operation. There is no “ground control” per se, it is all Side A and Side B and so on. Once implemented, blockchain is set in stone and can’t be modified in any way. In such networks, block transactions contain data on all prior blocks i.e. blockchain. Blocks cannot be deleted just added and every change is easy to spot in the records. Since you are aware of all involved parties and every action is recorded - it is easy to see who does what, when and how. This creates an incredible level of transparency of the operation that raises the trustworthiness of operation on a new dimension. And that is what blockchain very attractive to the AdTech Industry. Ad Tech is a kind of industry that embraces many nascent technologies and makes them work for its benefit thus evolving them and the business to the new heights. Sure, this attitude is spurned out of necessity, but it does not negate the fact that ad industry is rather open-minded in terms of adopting and developing new technologies. The blockchain is no different in that regard. In order to understand how blockchain can be applied to the AdTech industry, we need to understand the problems the industry is facing at the moment. Basically, there are two of them and both can be greatly eased by the implementation of the blockchain. One is transparency, the other is privacy. There are other issues but these are the two biggest. Blockchain advertising’s supreme transparency and relative security of privacy is something of a glimmer of hope for an Ad Industry battered by Ad Blocking and compromised by Privacy issues (among other challenges). As you know - lack of transparency equals lack of trust. The fact of the matter is - there are a lot of things happening in the dark during ad tech operations. With help of blockchain - a certain level of clarity can be achieved. The thing is - every involved party works with the same information. That and the fact that every action is visible creates a precocious constraint. In addition, none of the blocks can be modified - the only thing one can do inside blockchain is to add new blocks. Everyone sees everything. This makes any activity relatively easy to track and analyze. Trust issues are running rampant in the ad tech industry. The fact that one basically needs to rely on the kindness of strangers is not particularly reasonable but it is the reality of the business. And as such, it needs to be resolved. Hopefully, transparency of blockchain can seriously increase the trustworthiness of operations between all involved parties. That is especially important in dealing with third parties, such as DMP, SSP, and Ad Exchanges. What is the problem with third-party providers? Publishers and advertisers can’t see the specifics of how their money is used. This issue is complicated by often sketchy legal contracts and the general unwillingness of third-party companies to disclose their fees in full scope. But what implementation of blockchain to financial transactions can give is clarity. Everyone involved will see exactly what goes where and why and in which quantity. And that is a huge step forward in terms of building trustworthy relationships. The concept of smart contracts is brilliant. Plain and simple - it is a foolproof mechanism. If something is not right - it will not proceed. In essence, the smart contract is a piece of blockchain code stored within a system that defines agreed conditions of operations. The smart contract contains a certain pattern of actions that can be executed if all conditions are met. Any changes should be verified by all involved. Otherwise, nothing will happen. This thing helps in multiple directions. First of all, it seriously limits the capabilities of ad fraud to get into your system. On the other hand, the smart contract can give users a say in the targeting operation. One of the biggest virtues of Blockchain is that everything is visible and thus you have an idea what others do inside the system. This alone can seriously limit numerous fraudulent activities, such as bot traffic, domain spoof, and pixel stuffing. All you need to do is to check the numbers of impressions, assess their nature and verify their validity. Basically, blockchain is able to provide an additional checkpoint before the financial transaction that will partially limit ad fraud losses. But it is important to understand that blockchain on its own can’t save you from ad fraud. It can help but you also need other tools. Privacy is probably the biggest issue in the industry right now. While industry players pretended that it is not an issue for quite a while - now privacy concerns and direct actions to protect it actively choke the industry via Ad Block and other tools. While Blockchain is an open protocol by default, it can be used for the benefit of user privacy. There are two ways it can pull it off. First is due to a transparency and we already covered this earlier. The second way is a little bit more sophisticated. Here’s how it works. Instead of gathering data to one store - it is possible via blockchain to store data on user devices. Then, when it comes to targeting, verification mechanisms kick in and either confirm or deny further proceedings. It can be overbearing for the user, but it will sure give him more control over his personal data. What issues are there with blockchain and AdTech? The biggest challenge that holds back any significant development of blockchain technology is lacking scalability. The fact of the matter is - at this point blockchain is simply unable to handle such amount of operations. It is too slow. For example, Bitcoin is currently capable of processing around 2-3 transactions per second. In the case of ad tech real-time bidding operation, you need to process 2-3 millions of events and more. That’s a bit of an operational gap, right? Here’s why - blockchain is decentralized. It is stored directly on the devices of involved parties. Another important thing is that it is constantly growing. For example, once upon a time, bitcoin blockchain was sized 25 MB. Now it is 160 GB. That’s a lot. And that what slows things down over time. However, this slowness is justified. The thing is - you need to verify every operation. And that keeps in line every single action inside the system. One of the possible solutions to the problem is through the diverse use of smart contracts. This will allow to automate operations to a certain extent and make things faster. Another big challenge for full-scale adoption of blockchain in ad tech is lack of standardization. Why it matters? One word - compatibility. Standards are like universal language. Their existence guarantees compatibility and rapid development of the technology. Standards enable the combination of various solutions into one superior. At the moment, IAB is actively working on the guidelines, but it is a long way to go. Sure, there are custom solutions here and there, but lack of standardization means none of them are compatible with each other. Which also means that a joint effort in evolving the technology and exploring its further possibilities of use is virtually impossible. Sure, there are custom protocols, cases when the inventory doesn’t meet the specifications, as well as companies still working on OpenRTB 2.3 – released in 2014. This might become a severe issue with the blockchain, as its ecosystem relies heavily on the standardization rules and agreements. While blockchain is certainly a trendy buzzword, it doesn’t mean that there are many experts active in the fields. There are people who can write about blockchain concepts, possibilities, and opportunities. But talk is cheap (unless it is a Keith Richards album), it is the action that matters. And the reality is - there are not many of those who can do a thing or two with blockchain and not break into tears. In fact, demand vastly exceeds supply. And those who actually have an expertise on the subject are most likely already employed. This is a natural problem for any nascent technology. Basically, blockchain is still on the stage of early adoption when the industries are yet to be convinced in embracing the technologies and its possibilities. At the moment, blockchain is still an emerging technology with nothing particularly definite in its fold. While it is surely established itself is a viable technology that is able to solve certain biting problems here and there, there are still not many practically feasible and economically justified solutions for full implementation. However, that is more of a question of time than an actual problem. In the context of Ad Tech industry - blockchain is something of a dream in the process of very slow realization. It will take a lot of time before it takes off. The concepts are there but the solutions are not there yet. Because of that, the only thing we can all do is to wait for more things to come. Looking for a team of smart developers?